Fraught with fun, hiking, adventure, thrills, chills – way more than was listed on the brochure. The trip started out fine. After a nice lunch, we did a bit of gift shopping, then back on the van. We drove around – we went all the way around the Hakeakula Volcano – more hills, mountains, waterfalls, until we went past South Wailua Falls. Someone had put a statue of the Virgin Mary in a little grotto by the side of the road – and kept it maintained with flowers. We stopped at the Sacred Pools at Oheo and climbed down the cliffs. We could have gone swimming there – many did – but there were so many warning signs we decided not. Of course, we had to climb back up the cliff! The pools are now part of the Haleakala National Park. I am now the proud owner of a T-Shirt from this park! Our next stop was the rustic Palapala Ho’omau Church (1864) where we saw Charles Lindbergh’s grave and many others. On the west shore of Maui a picturesque church, constructed of lava rock and stucco, faces west over the great Hawaiian waters of the Pacific. The Palapala Ho'omau church was constructed in 1854 by Congregational missionaries from Connecticut. The grounds are lush and look much as they did 150 years ago – shaded by banyan, pine, wild plums, and coconut trees. Beneath the fertile vegetation an open secret lies buried between the graves of aviator Charles Lindbergh and his friend Sam Pryor, a one-time vice president of Pan American airlines. Soft light filters into the sacristy through a magnificent window, backlit with a likeness of Christ. His gaze lingers protectively over the graves of the Pryors, Lindbergh, and Pryor's pet gibbons – the only non-human primates buried in hallowed ground. Charles Lindberg was introduced to gibbons during a visit to the Pryor family estate in Kipahulu. It was a typically rainy, tropical morning, and Lindbergh was shaving and covered with lather when he heard a commotion at the door of the guest cottage. The then-resident gibbon, "Hula," jumped into his arms when he opened the door to investigate and remained wrapped in his arms until late morning, when Pryor noticed "Lucky Lindy" walking up the hill with Hula clinging to his neck. According to Pryor's account of the incident in his autobiography All God's Creatures, the windy night had disturbed the little gibbon, and she turned to Lindbergh for comfort from the storm. Lindbergh was so taken with the remote beauty of the setting and the antics of Hula that he brought his wife, Ann Morrow, to visit on his next trip; eventually, Lindbergh built a cottage there, on five acres of the Pryor family beachfront property. 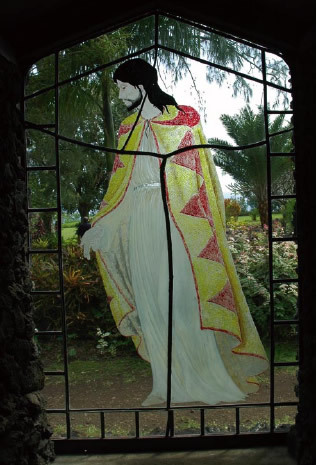 In fact, Lindbergh became so attached to this family retreat that he chose to be buried at the Palapala Ho'omau church (only a twenty minute walk away down a dirt road), which Pryor had carefully restored to its original condition. Lindbergh is buried in a simple plot, which, like the church, faces west across the sea. At his request, he was buried in his work clothes and boots in a simple ceremony above the dramatic cliffs, with the azure waters of the Pacific perpetually roaring hundreds of feet below. His good friend Sam Pryor is buried nearby. 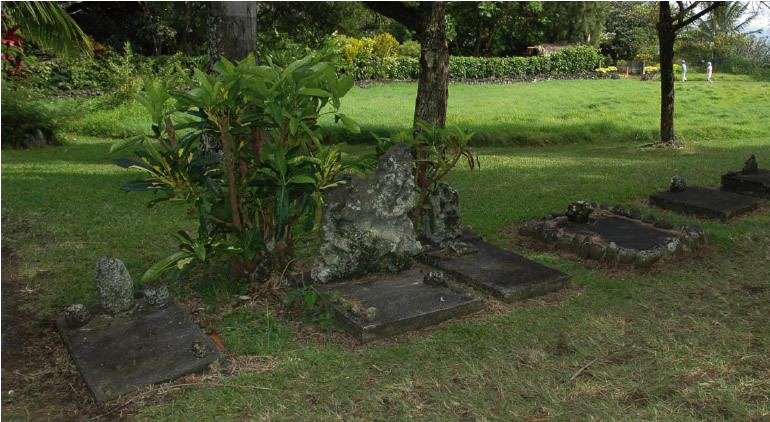 Six diminutive, weathered cement markers lie between the graves of Pryor and Lindbergh in the historic church cemetery located on the edge of Kipahulu town. They shelter the remains of six members of Sam Pryor's family – "Kippy," "George," "Keiki," "Ganza," "Hula," and "Blackie" – six of the gibbons he loved. Pryor's first gibbon was "Kippy," whom he acquired from the director of the Animal Research Institute of Japan. He found the gibbon in a pet store in Tokyo when the two-month-old creature reached for him with two tiny arms from his temporary sanctuary in a wicker basket. Immediately entranced, Pryor inquired about the price of the animal, but was told Kippy was already promised to the aforementioned director. Somehow, Pryor was able to convince the director that the infant ape was destined to become a member of the Pryor family and menagerie of pets. For the rest of his life, Kippy traveled with the Pryor family from Maui to Greenwich, Connecticut, and even managed a small "role" in a Tarzan movie, before he was buried in the cemetery of the old Hawaiian mission church outside of Kipahulu. Along the way, Kippy literally "hung out" with politicians and movie stars, including actors Eddie Albert and Vincent Price. Unfortunately, on a trip to the Seven Sacred Pools on Maui, Kippy devoured a tropical flower of unknown origin and died shortly thereafter. The weathered marker in the Palapala Ho'omau graveyard is almost illegible, but if you look closely, you can read "Our Devoted Friend, Kippy." The gibbon graves were not an afterthought, but a calculated effort on the part of Pryor that the gibbons be "a part of posterity and there for my grandchildren to see." Tour operators have offered many inaccurate explanations for the tiny graves. Some call them "monkey graves" or the "family pets," and tourists traveling alone have been heard to mutter that they are "inappropriate graves for children." Pryor would not acknowledge a difference between people and animals. Once, while on a trip to Alaska, Pryor was stopped by a perplexed security guard as he tried to bring his pet gibbon, "Keiki Auli'i," ("cute" or "perfect child") into a shopping center. The story goes that Pryor very simply explained to the officer that "I'm a human ape, you're a human ape, and he's a gibbon ape." For Pryor, animals and people were all God's creatures, but animals got along better than humans. After Pryor passed away, two of his gibbons found a new home – at IPPL's Headquarters Sanctuary in the South Carolina Lowcountry. Young Sammy passed away in 1997 from a virus he had contracted prior to coming to IPPL (see Sammy's profile in IPPL News, April 2005), but Sammy's father, Palu-Palu, is still alive and doing well, as part of another human/gibbon family at IPPL. After the church, we were driving along and our driver slowed so we could take pictures of the cliff to the sea – no guardrail! – that we were driving along. The last of these images shows how close to the edge we were. This was taken from INSIDE the van. We drove off and started up more of the volcano. Because we had slowed down for the pictures, the van didn’t have the power to get up the hill. Unbelievable! We decided that if we got out, the van might have the power. But there was solid cliff on the right so we couldn’t get out. So, we backed down the hill, to the place where that picture was taken. I was sure we would back right into the Pacific. In the process, we lost the front bumper to the cliff. Well, of course we didn’t go into the sea but I was so scared! We finally stopped and got out. Another van behind us said that they’d send someone out for us from the other direction. No cellphone service here! We trudged up this hill – volcano! – in the heat of the afternoon. Our driver was able to make it without us so she met us at the top of this hill. I don’t know why they don’t make those with standard transmissions. I think that would have done better. We drove a bit further, through Maui’s last lava flows. in the upcountry. Another hill, had to hike. Nice views this time, though. Not so scary, either. But HOT! I think we hiked one more hill, then Tom had the bright idea of turning off the A/C to give the van more power. We opened windows and that worked for one small hill but the driver knew we wouldn’t make it out of a river bed so she called again for the replacement van – we had cell service here. The other van was only 15 minutes away (HA!). So we stopped and waited. And waited. Some got out. I took a nap. Finally, the van could be seen – only about 15-20 minutes away. Hmmm. Finally got to us. YEA! Took all our stuff and moved to the other van. The driver of van 2 stayed with that one until the mechanic got there. We left her 2 bottles of water. I don’t know why the mechanic didn’t come with her but I didn’t care! We were on our way again. WooHoo! Because it was so late, we didn’t get to go to the winery (with tasting) but we were all glad to be on the road again. We stopped for a rest stop at a little park. Then back to our start. Just near the end, we saw a little rainbow. A fitting end to a successful day. Back at our place, I was exhausted. Fell asleep by 9, slept for 10.5 hours. Work up with sore muscles.